Do those few thousand kilometers of difference going around the earth significantly affect the amount of thermal energy the moon receives from the sun to warm up its surface? Also, are there more significant differences between these variables when the earth goes from perihelion to aphelion and vice-versa? Roughly speaking, the moon's orbit has a semi-major axis of about 400,000 km. The semi-major axis of the Earth's orbit is 149.6 million km. The intensity of sunlight received by the Moon depends on the inverse of the square of the distance, so the difference amounts to $((1.496e8 + 4e5)/(1.496e8 - 4e5))^2$ = 1.011, or about 1%. So, not very much. The variation in Earth's distance from the Sun is about five million km, so that's going to have more of an effect than the lunar orbit itself (as Chappo pointed out in their comment). That works out to a variation of about 6.9% in insolation from perihelion to aphelion. 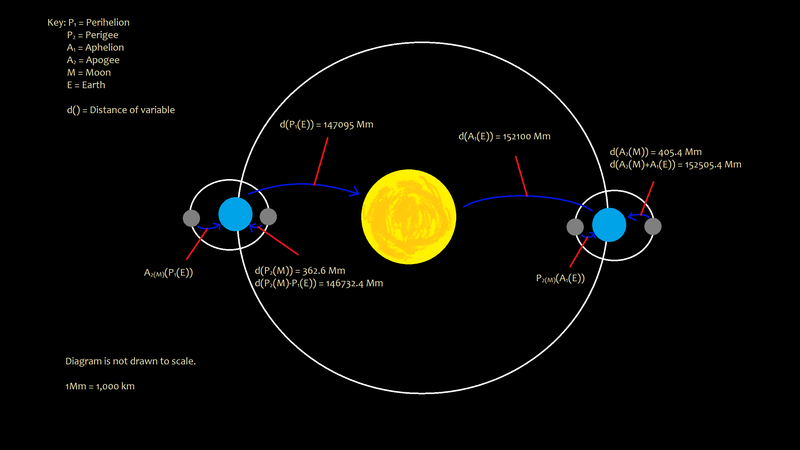 The maximum possible variation -- full moon at aphelion versus new moon at perihelion -- would be $((1.521e8 + 4e5)/(1.471e8 - 4e5))^2$, which works out to about 8.1%. The difference in insolation from new moon to full moon at perihelion is about 1.09%, versus a difference of 1.06% at aphelion. Not the answer you're looking for? Browse other questions tagged orbit the-moon natural-satellites heat or ask your own question.